Lithograph printed in Handschy Black Proofing ink, a fine, fresh impression of the only state, the full sheet, printed on 225gsm white UK Somerset Satin paper, with margins, hand-signed, dated, titled and numbered in pencil by the artist, hand-colored by the artist in watercolor pencil, executed in a variant edition of 20 examples (there were also 2 numbered Artists Proofs, 2 numbered Hors Commerce proofs, 1 Printers Proof, 1 Center for Contemporary Printmaking Proof (CCP) and 1 Bon à tirer proof), printed by Deb Chaney at the Center for Contemporary Printmaking, Norwalk and Deb Chaney Editions, Brooklyn, published by World House Editions, Middlebury, Connecticut, in fine condition, unframed. Harrisonburg, Virginia, Duke Hall Gallery of Fine Art, James Madison University, Record Keepers, 23 October - 01 December 2018 (another example). 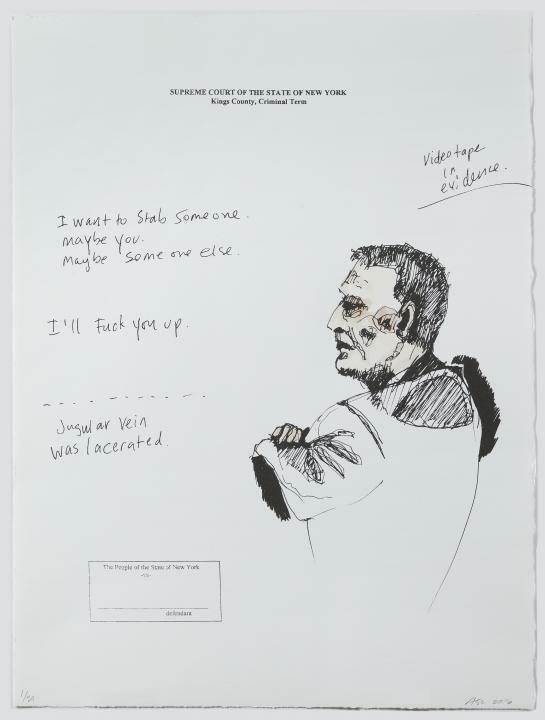 Executed in New York in 2016, the present work is the second in a series of prints the artist has called her "Courtroom Prints."